Julio Urias gets back on track, Joc Pederson continues to hit, and Corey Seager returned from injury. In transaction news, Jon Garcia was demoted from AA to A+. Garcia is still in his age-22 season, but he’ll no longer be young for AA in his next attempt. Hitter Of The Day: Joc Pederson (AAA) went 3-for-4 with two walks and a stolen base. He’s 12-for-27 with two homers and four stolen bases on the week. Pitcher Of The Day: Jose Dominguez (AAA) pitched two innings, striking out four and allowing just a hit. No choice but to continue believing in his plus arm, but there has to be concern about hittability at the MLB level if his woes continue. Victor Arano (A) allowed five baserunners in five innings and struck out six but coughed up three runs. Some concern about how he’ll fair against advanced bats, but for now he’s doing his job well. Hitter Of The Day: Alex Santana (A) went 0-for-3. For the season, he’s at .200/.310/.337/.647, and if he’s moving to left field permanently, it puts even more pressure on his bat. Pitcher Of The Day: Chris Anderson (A+) went five innings of two-run ball on five hits, striking out seven and walking just one. I expect more days like this going forward. Hitter Of The Day: Joc Pederson (AAA) went 3-for-4 with a walk, his sixth homer, and he stole his ninth base. What more can he do? Joc’s even started hitting lefties a bit harder this past week. 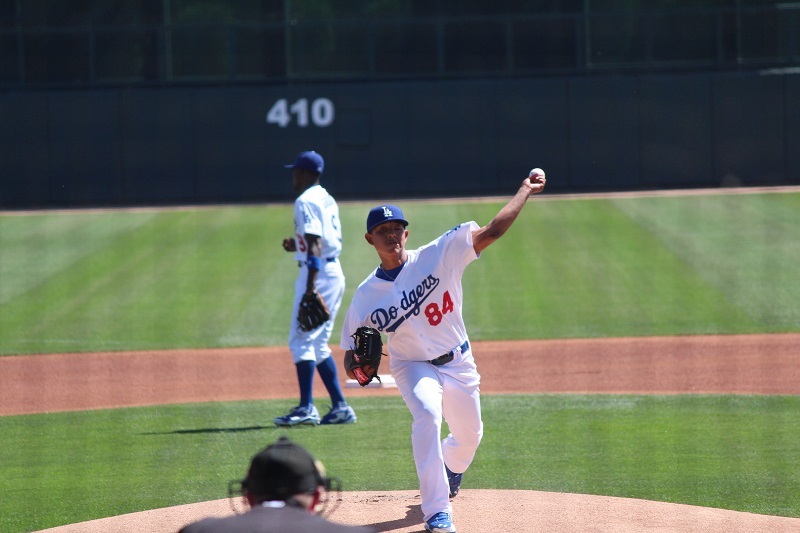 Pitcher Of The Day: Julio Urias (A+) got back to starting games again and pitched three perfect innings, striking out five. This was a doubly important outing to show he was healthy after reports came out that he was struggling because of lingering arm soreness after being hit by a comebacker. Alex Guerrero (AAA) went 2-for-4 with his third homer. For the week though, he’s 4-for-21 and the homer was his only extra-base hit. Yimi Garcia (AAA) worked two flawless innings in relief, striking out three. Yimi has to be the next reliever in line at some point. Erisbel Arruebarrena (AA) went 2-for-4 with a double, a triple, and two strikeouts. Flashes of promise combined with contact woes. Clayton Kershaw (AA) pitched five innings and struck out nine. He allowed six hits and two walks, which led to two runs (one earned). You heard all about it before, but he appears ready to return to the bigs. Kyle Farmer (A) went 3-for-5 with two doubles. Farmer now has a .320/.368/.447/.815 line with seven walks and nine strikeouts. Scott Barlow (A) made his season debut, going four innings and surrendering three runs (two earned) on five hits. He struck out four and walked none. Why mention this? Because prior to his Tommy John surgery in 2012, Barlow had rotation-worthy stuff. He struggled last year in Rookie-ball, but it’s easy enough to chalk that up to surgery recovery. 2014 will go a long way to determining whether he’ll ever get his stuff back. Hitter Of The Day: Joc Pederson (AAA) had only one hit in four trips but made the most of hit, bombing his seventh homer. Pitcher Of The Day: Matt Magill (AAA) got back on track a bit, allowing just two runs on five hits in 6.2 innings. He struck out three and walked just one, the latter total is of the most importance. Magill needs performances like these, because when you get leaped by Red Patterson and Stephen Fife, that’s not great. Hitter Of The Day: Erisbel Arruebarrena (AA) went 0-for-2 with a strikeout and made his fourth error. Only getting four starts for the week, he went 2-for-11 with five strikeouts and a walk. Pitcher Of The Day: Tom Windle (A+) went seven innings of scoreless three-hit ball, walking two and striking out seven. Windle appears to be back on track after hitting a rough patch for a few starts. Chris Reed (AA) went 5.1 innings and gave up five runs (three earned) on three hits. Reed struck out eight, but walked four guys, showing the inconsistency that has plagued him as a pro. Jacob Scavuzzo (A) went 0-for-4 with two errors in the field. If last week was feast for him, this was famine, as he went 2-for-27 with no walks and seven strikeouts. Hitter Of The Day: Corey Seager (A+) went 1-for-4 with a walk. Most importantly, he returned from a hamstring injury and made it through unscathed. Pitcher Of The Day: Victor Arano (A) got knocked around for five runs and eight hits in four innings, but still managed five strikeouts and no walks. Hitter Of The Day: Tim Federowicz (AAA) went 1-for-3 with a double and two walks. He’s 2-for-9 with a double, three walks, and two strikeouts thus far. Whatever went wrong in the MLB, hopefully he gets his confidence back in Albuquerque. Pitcher Of The Day: Chris Anderson (A+) went five innings and struck out seven while walking two. However, he surrendered two homers and four hits to bring his tally of runs given up to four. 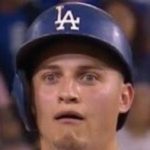 Joc Pederson (AAA) went 3-for-4 with a walk and his 10th stolen base. Corey Seager (A+) went 3-for-5, which is not remarkable for him, but it’s great that he’s picking up where he left off.